I don't know why anyone living in Hawaii would want to travel anywhere else in the world. Do Hawaiian people travel? Maybe they don't. There's no need. Hawaii has it all: weather, food, culture, music, lifestyle, shopping, beaches, mountains, forests, even snow and ice for those of you (weirdos) that find warm, sunny days boring. In case I'm not being clear enough, yes, Hawaii rocked. As I stated previously, we went to the big island (called Hawaii) first, which (in my opinion) was the better of the two (the other being Oahu). Only problem was that our flight wasn't direct, so we had to stop in Honolulu (Oahu) first for five hours, which was kind of silly considering that we would be coming back there in a few days. Had we stayed in Oahu first, we could've had almost a whole extra day of holiday. Of course such foresight is beyond the power of the Japanese tour company that we used to arrange our trip. Next time we'll just arrange the trip ourselves. However I can forgive them a little bit for the hotel. 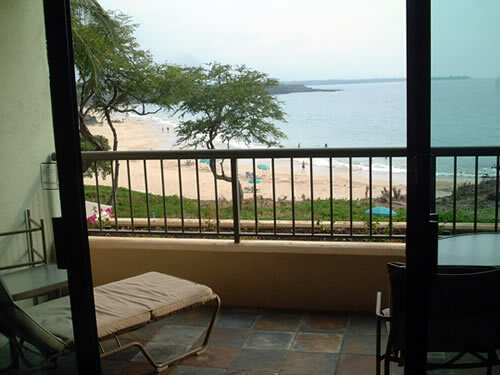 We stayed at the Hapuna Beach Prince Hotel which was definitely the best hotel I've ever stayed at in my life. For one thing, it was massive beyond description. When we parked our (rental) car and tried to find the lobby, we got lost. Once the lobby was discovered, we tried to find our room and got lost again. Terraces, pavilions, gardens, buildings, galleries, etc. were everywhere, and the best thing? 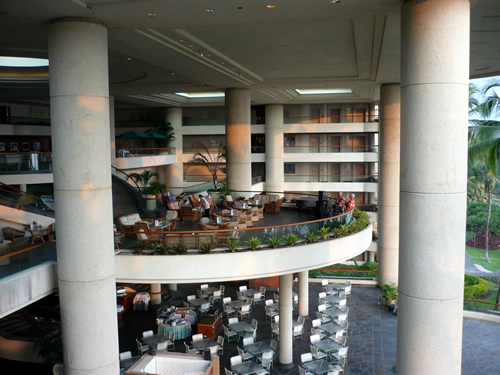 The hotel itself appeared to be deserted. If I didn't know better, I might've thought we were doing another haikyo. When we asked the staff about it they assured us that they were at about 60% capacity, that it just seemed that way because of the size of the place, and that this was a very common question from guests. Most of the hotel was built on an open plan like the below picture, so you're always surrounded by fresh air and ocean breezes. Here's part of a lounge (notice I said a, not the) and the area where we ate breakfast, which was also amazing. 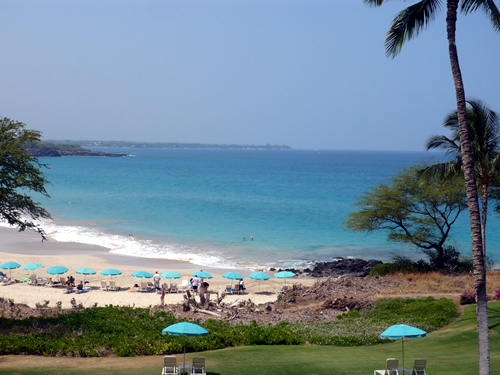 The hotel was located on the North side of Hapuna beach, which has won the 'Best Beach in the USA' award many, many times. This is the view from our hotel room. Being hotel guests, we had our own beach chair and parasol waiting for us when it came time to chill out. Paradise. Our room was massive, had a super massive bathroom, and had an awesome balcony for more relaxation should it be necessary. It was necessary. Just blue water and white sand. Like I said, breakfast was amazing. There was this huge buffet (sorry forgot to take any pics, too busy eating I guess) full of every conceivable kind of breakfast thing you could want. I ate fresh tropical fruit, pastries, bacon, eggs, coffee, etc. every morning. 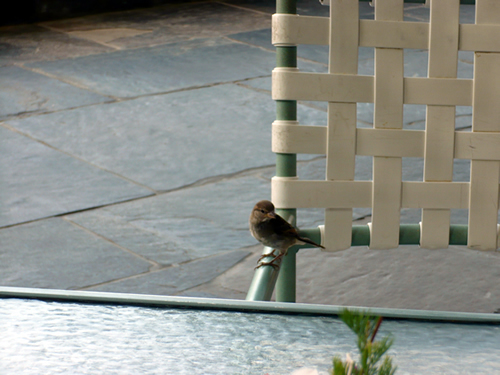 While you ate, birds would flit around hoping for handouts. Some of them would fly right up to your table. Being a bird lover I was happy to oblige them. For our first full day in Hawaii we decided to go driving around the island a bit. Our main destination was Greenwell Farms. 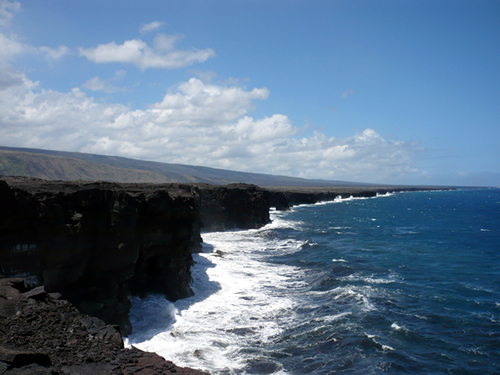 Hawaiian Kona coffee is world famous, and is perhaps second only to Blue Mountain coffee from Jamaica. Our hotel served it every morning and being something of a coffee lover and connoisseur, I have to say, it was pretty impressive. 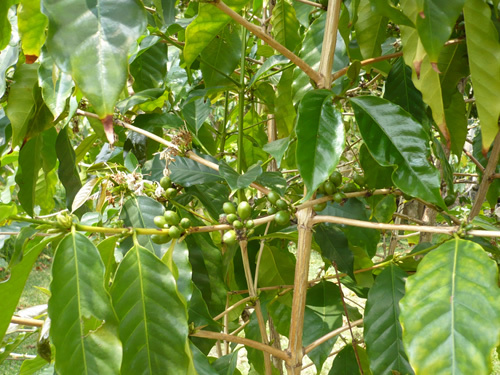 There are coffee plantations all over the Kona belt on the big island, but Greenwell was supposedly one of the better ones. They give a nice (free!) tour that takes you around some of the coffee trees and equipment, and explain (and answer questions) all about how coffee is made. They also offer as much free coffee as you can drink as well as free samples of chocolate covered coffee beans. Woohoo! 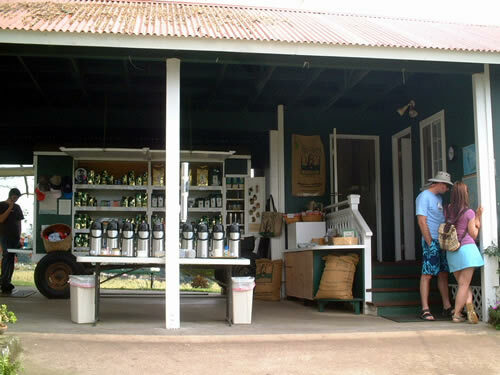 Here's the little gift shop where I bought a few bags of coffee to take home for my drinking pleasure. Most of the beans on the trees now are still green. Greenwell also had orange and avocado trees here and there. 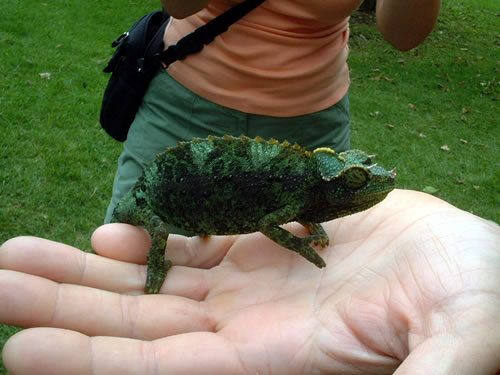 One of them had a chameleon hanging around in it. Our guide plucked him out for us to see. I'm not really a fan of disturbing wild animals in their natural environment, but I took a picture anyway. 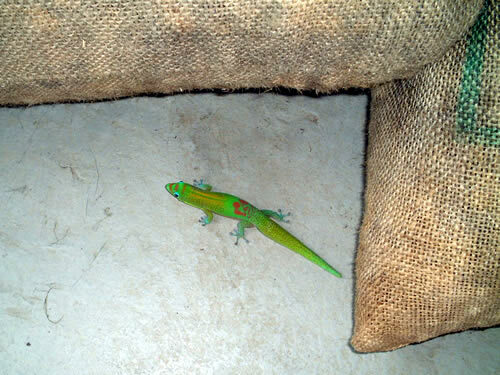 A gecko scuttles between two bags of coffee beans. Maybe the smell keeps him awake? On the second day we decided to go stargazing. 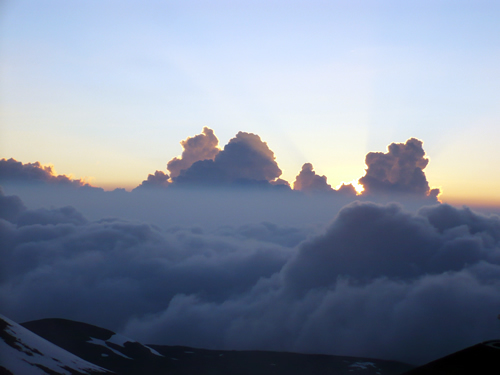 Unknown to most, the tallest mountain in the world is in Hawaii. Yes I know, Mt. Everest is known as the world's tallest, but when you measure Mauna Kea from it's base, which is 19,000 feet below the ocean, then it is the definite record holder. It's still no puny mountain at 14,000 feet above sea level, and definitely the highest point on Earth I have ever been to in my life so far. So high in fact that I had trouble breathing properly. Apparently the oxygen level here is 40% less than at sea level. 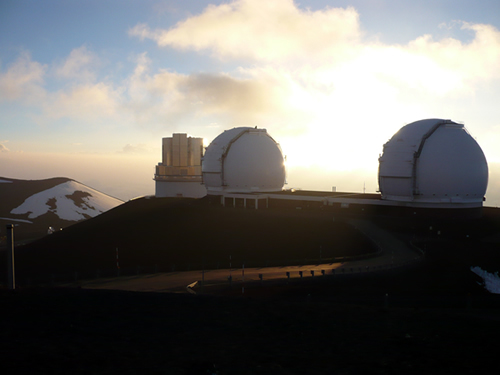 There are about 14 or so observatories on the top of the mountain, and even though I knew I wasn't going to be able to have a look through one of these massive telescopes, it was still disapointing to be so close to them and not even be able to go inside. 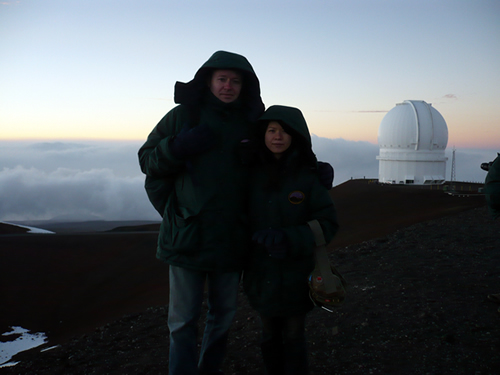 Our guides brought these fairly large telescopes with them so we could do some star watching, but everytime they pointed it to some part of the sky, and started to explain what it was, etc, a cloud came by and covered it. After the third time in a row of this, people started grumbling to show first, and explain after. In the end I only got to see Saturn, two galaxies that were tearing each other apart, and the Orion Nebula. All of them, (with the exception of Saturn which looked pretty good), were fuzzy and unimpressive. Kumi and I both agreed that it was nicer just to look at the thousands of visible stars with the naked eye, which we both did. It was friggin' freezing up here! They warn you how cold it's going to be, but being in Hawaii, you somehow don't really believe it, until you get to the top of the mountain of course. One bonus of being on a tour, they provide parkas and gloves. There were some fools who came in their own cars, wandering (well running actually) around in long sleeve shirts only. I was cold even with a sweater, parka and gloves. The temperature was well below zero, probably about -10 degrees celcius. Take me back to the beach!! Although our guide was very knowledgeable and a nice guy, stargazing itself was extremely minimal and unimpressive, also it was colder than hell which brought the enjoyment down as well. This tour was fairly disapointing overall, not worth the money we paid. Oh and I also got sick today, which is a swell thing to happen on your honeymoon. To then spend the evening in a freezer at a super high elevation probably didn't do my body any favours. In fact, my ears became totally stuffed up so that I could hardly hear my own voice, even better, when I went back down they didn't unpop again. This was to last for three days until I finally went to the doctor (in Oahu) and paid $135 for an appointment and some medicine. Annoying to say the least. Once the sun went down it was pitch black up here, so pictures ended with the sunset, which was quite beautiful to watch. You feel like you're in an airplane, only you're outside. The next day we woke up early and spent the whole day doing the volcano tour. I was still sick so all I wanted to do was stay in bed, but I made myself wake up and go. Good thing I did as this was the best tour we went on. 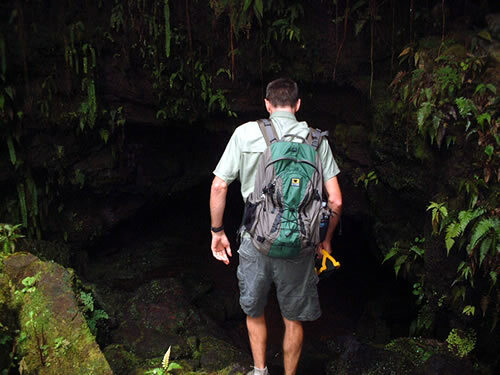 Here's our guide, Garry, decending down into a lava tube, which is an underground cave-like structure left over from a previous lava flow. The most famous lava tube on the island has built in lights inside, handrails and lots of tourists. We didn't go there. Instead Garry took us to a lesser known one with no lights, no walks or handholds, and no other people. Once deep inside, we all turned off our flashlights and got to see what it's really like to be completely blind. Garry was very knowledgeable about volcanoes and geology, as well as in other scientific areas like birds and plants. He was also extremely funny, and the whole day he entertained us as we drove around, something that made the long drives on Hawaii's rough interior roads much more bearable. 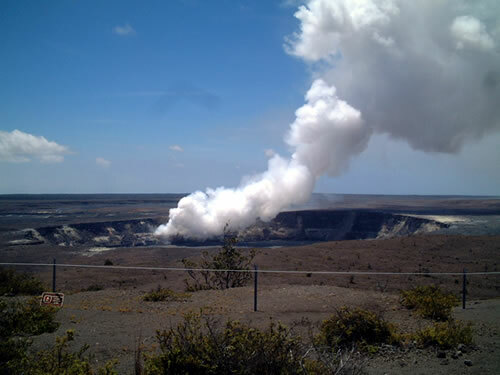 The next stop was the smoking crater of Halema'uma'u. I was a bit disapointed that no lava was flowing or spewing out, nor would we be able to see any during the rest of the tour. Volcano lava is apparently very fickle, and it's just luck of the draw if lava happens to be visible on the day you go or not. 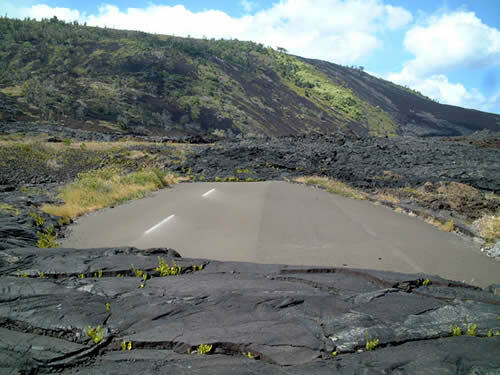 While we were in Hawaii, lava was flowing at only one spot, directly into the ocean, and the only road going there had been destroyed. As it was, we were lucky to even get this far. This park/viewing point had been closed until yesterday due to winds that were blowing the poisonous volcanic gas inland (toward the viewing point), instead of out to the ocean. We had lunch on the edge of these windy, but picturesque cliffs. Way down near the edge of the shot is where the lava is flowing into the ocean. Occasionally we'd see a big puff of steam rising. The old road. Had you left your car parked here back during the eruption, it would've been fine. Of course you never would've gotten it out again, unless it had four-wheel drive. In some areas where the trees are wet, the lava won't burn them. Instead they'll last long enough for the lava to harden around them before disintegrating, leaving holes dotting the lava landscape. There are two main types of lava. 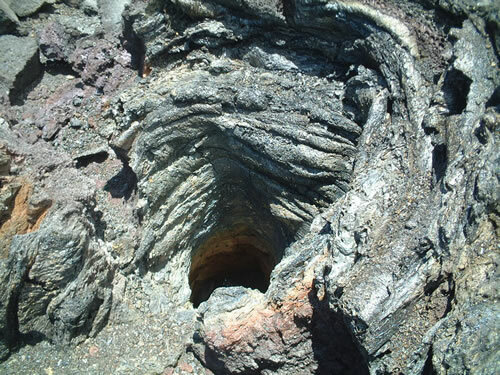 The smooth, ropy kind is known as pahoehoe (seen above and below), and the other kind is called a'a. 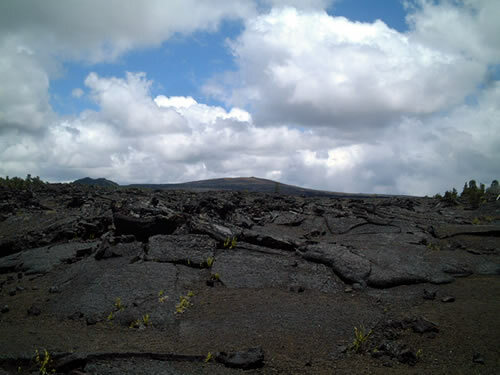 A'a lava looks like crushed, broken up cement. Both have the same chemical composition, but differ in that pahoehoe contains more gas, and is hotter. So ends your geology lesson for today. To be honest, after driving through endless devastation, I was sick to death of lava. When we drove into treed areas, it was like a breath of fresh air, literally. We stopped by an area with signs explicitly telling us to keep out, but Garry wasn't concerned and took us in anyway. Apparently in this spot, so the story goes, there was a horse trail that cowboys used to use. Off to one side of the trail there was a small hole in the ground which, while noticed, never caused much comment. Then one day they rode in and discovered that the hole had grown somewhat.... Seems the ground just caved in one day. 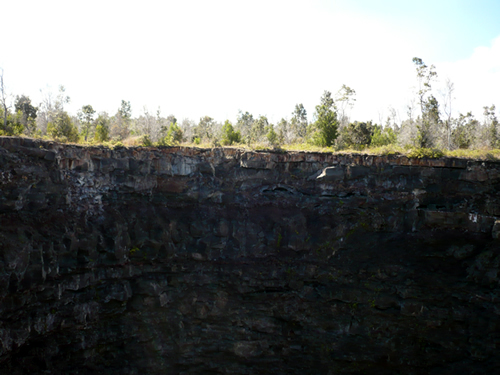 The hole was too deep to fit in both the rim and the bottom (about 300 feet deep) into one picture. Then we were put to work. Garry took us to a section of the forest where wild, inedible ginger was displacing the native plants. We were told to pull the ginger out by the roots. This wasn't really part of the tour, but Garry did it just to help out the rangers. Anyway it only took about 10 minutes. One lady complained a lot about doing this, saying stuff like 'I came here to have a vacation, not to work', etc. I felt like saying 'Just chill lady'. 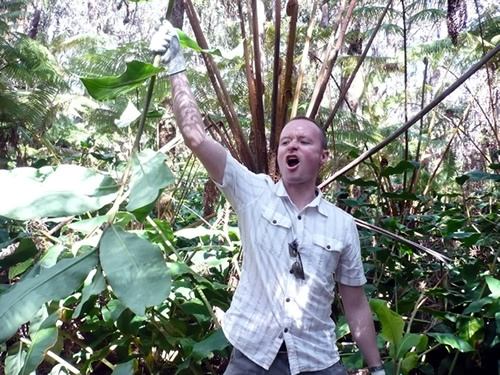 Here I am having beaten and subdued an evil ginger plant. The next day we headed back to Oahu. I wasn't wild about returning to civilization just yet, but Honolulu is a pretty nice city (well except for its rush hour traffic which is pretty crazy). 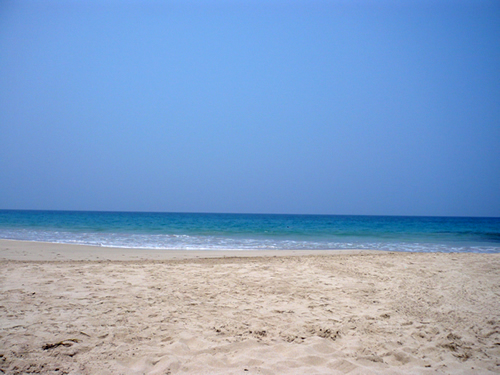 It has a relaxed atmosphere to it, people don't rush about like mad, there is room on the sidewalks and buses, and of course it has beaches and awesome weather. I could live here easily. Here's Ala Moana beach in the late afternoon, almost empty! 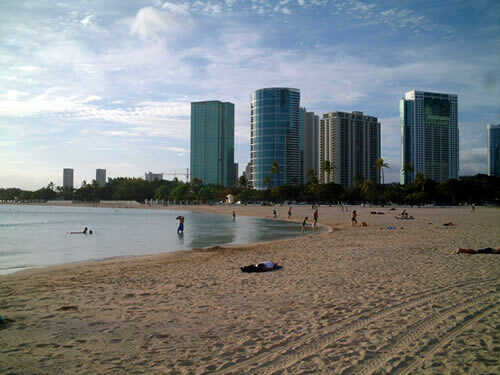 Waikiki beach is about a 20 minute walk away. Chill time! We hiked up Diamond Head on the second day. 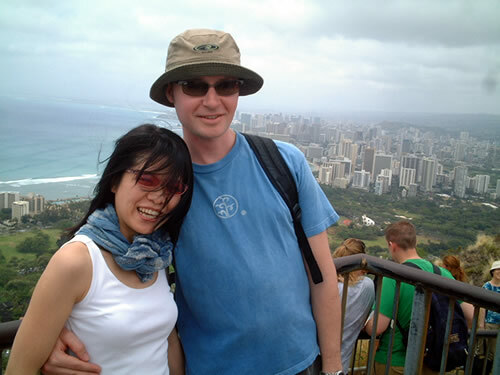 Here we are overlooking Honolulu and the ocean. We saw one old guy running up the hiking trail and overheard someone else ask him how he was doing He replied that he had already run up and down 7 times today, and was doing one more before stopping. Way to go old guy. Although seemingly hard, to be honest the hike up was dead easy. 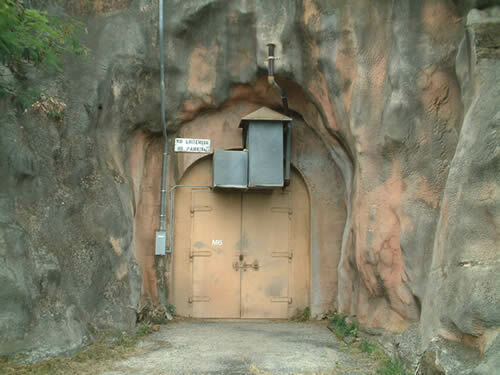 On the way up we walked past a hatch-like entrance set into the mountain. I was reminded of my favourite TV show 'Lost' which is filmed on Oahu. 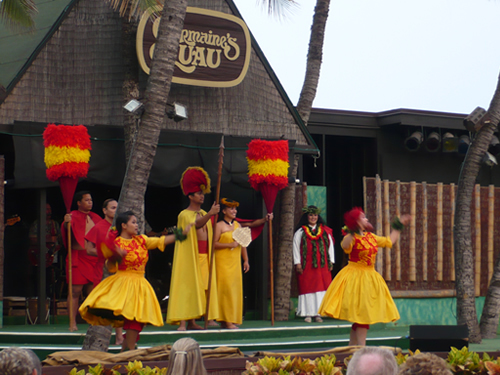 In the evening we went to a Luau, which is a traditional Hawaiian dinner with dancing, etc. 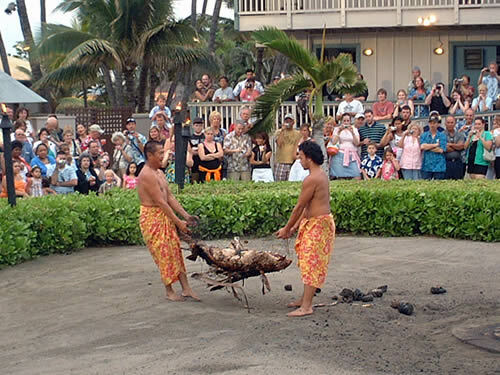 Below are a couple of guys pulling the roast pig out of a traditional underground oven. Looked kind of gruesome actually. Then we ate and drank while watching Hawaiian hula, etc. To be honest, the food was only so-so, and while the dancing was good, there was way too much audience participation stuff which Kumi and I both found annoying. More than half of the time they kept getting people to come up and make fools of themselves on stage while the MC tore into them, making them look even sillier. Kind of funny but I paid to see real hula, not this amateur stuff. Still, we got leid (the state joke, get it?) and three cocktails were included with dinner. On our last day, we took a boat out to a secluded spot, and spent a wonderful time snorkeling around the coral reefs. At least that was what was supposed to happen. After a late start, we spent a good hour on the boat heading to a secluded spot around the island. Once there, the captain announced that we couldn't stop here because the ocean was too murky and they couldn't drop anchor, so back we went. Another 40 minutes and we were almost back where we started. Some poor lady spent most of the return trip in the washroom throwing up. Once there, no less than 3 other boats also joined us and our so called secluded snorkeling spot was now a feeding frenzy of hundreds of people all swimming around the same area. Needless to say, I kicked, and got kicked in return many a time by other people's flippers. It was the snorkeling equivilant of riding the rush hour train in Tokyo. 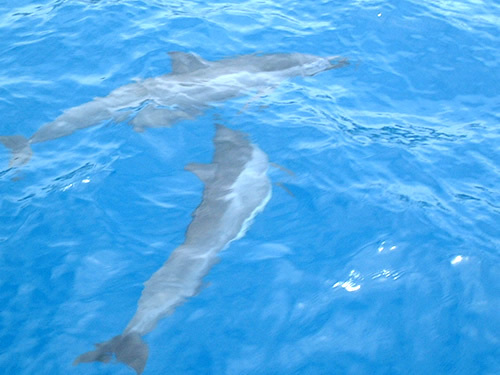 There were good points of course, the boat stopped while a pod of dolphins played around us. I tried to get some good photos but they didn't turn out so well. None of the dolphins jumped out of the water much. You gotta love dolphins though. You can't post about Hawaii without talking about food. Most Hawaiians are big, and the Americans visiting there are bigger still. It's simply impossible to get a 'snack' when going to any restaurant in Hawaii. Living in Japan all this time, my stomach really has shrunk (which is probably a good thing) and most of my time in Hawaii was spent being full. Near the end of our trip I gave up even trying to finish everything put before me. But generally the food was great. I ate steak at least three times, and unlike Japan where they give you a small side dish and about three french fries, in Hawaii the side salad or vegetable is a meal in itself, and you get about 1000 fries. Drinks were even better. 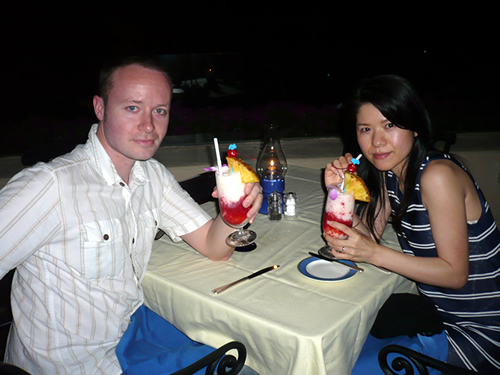 Of course I had to try the famous 'mai-tai' but Kumi and I discovered this drink creation known as a 'lava flow' which is a mixture of strawberry juice, coconut syrup and pina colada. We drank one every night we were there! I even bought a bottle of coconut syrup so we could make our own. And then it was time to leave again, but I definitely wasn't ready. Despite most of the tours we went on being mediocre and generally way too expensive, Hawaii is still a paradise and just being there was enough to satisfy me. I guess the only thing to do now is move there. I'll be back! Aloha Hawaii and Mahalo.